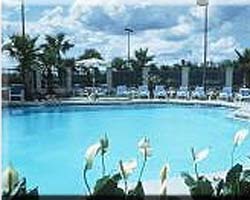 The European-style Renaissance Orlando Hotel is situated just one mile from the Orlando International Airport. This stately property is within close proximity to Orlando's central business district, Airport Corporate Complex and the Orlando Convention Center. Additionally, Orlando's world-renowned entertainment attractions, including Walt Disney World, Universal Studios Orlando, and Sea World are just minutes away, and Cocoa Beach and the Kennedy Space Center are only a 45-minute drive from the hotel. Outstanding service has earned the hotel the U.S. Association Executive magazine's distinguished Aster Award for outstanding service and excellent conference facilities. Guestrooms are tastefully appointed with amenities to make every stay as comfortable and convenient as can be. The Renaissance Orlando Airport is convenient to area dining, shopping and entertainment venues.